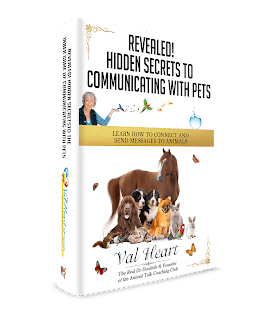 Hi, you know me – I’m Val Heart, The Real Dr Doolittle and internationally recognized Expert Animal Communicator with my best friend, Einstein. You also know your animals have secret wisdom, knowledge and healing abilities, right? Without communicating with them, you simply can’t know what they’re thinking, and you won’t be able to access their thoughts and innermost feelings. You may think that the only option you have is to hire a professional to communicate or work with your animal friends. But what if I told you that YOU can learn how to communicate with them simply by developing your own innate telepathic abilities? Imagine, you could simply tune in and converse with them like you do with your best human friends, anytime day or night. By asking them a question and listening in a different way using your heightened sensory perception, you could find out yourself how they’re feeling, if they are in pain, what they need or want, and even what they can tell you to improve your own life. The truth is this: Your animals are communicating with you all the time… in every way they know how. Most animals I’ve talked with tell me how sorry they feel for their humans because they seem so dense. They have to get really basic and very demonstrative before their human friend can understand them, and it saddens them because there is so much they want to share with you. The remarkable fact is that you do pick up on some things… you may not know how you know what you know, or where the impression or thought came from. That’s because you are not as consciously aware, focused or open enough to hear them… yet. If You Love or Have Animals in Your LIfe, You NEED to Know How to Communicate With Them. Did You Know That Being Able to Hear and Understand Your Animal’s Needs, Pains and Wants Can Actually Save Your Animal’s Life? 3 Lucky Winners will be announced the week of August 20th, 2012 – YOU could Win!